The Yoshi series is one which for a while struggled to find legitimacy beside its father series, Super Mario. Yoshi games carry a lot of aspects over from the Mario series; heck even the cast of Super Mario appear as Babies for Yoshi to protect. In fact Yoshi’s very own series is a prequel to the Nintendo’s flagship franchise. This seems pretty natural considering even during the development of the original Super Mario Bros. Miyamoto had wanted a dinosaur sidekick to help Mario on his quest to save the princess; Yoshi was always designed to be part of the Mario universe. It wasn’t until Super Mario World however that the dinosaur finally debuted, bringing with him a unique set of skills that he’d later develop in his own series. But it would take another 5 years for the dinosaur to star in a game which allowed him to flutter out of Mario’s shadow. Interestingly this is the only time any Mario character has tackled the shooter genre. Still something about the name Safari troubles me… are we shooting Goomba for sport? Yoshi first received his own game in 1991 simply titled Yoshi on the NES and Game Boy. It was a puzzler not too dissimilar from Tetris which received a sequel in Yoshi’s Cookie a year later. He also starred alongside Mario in Yoshi’s Safari, a rail-shooter that utilised the Super Scope on the SNES. However none of these titles gave Yoshi a series to identify with, it seemed Nintendo were using his popularity to push other products, like Tetris styled puzzles and underused peripherals; arguably Yoshi was being used as a gimmick to push other ventures. And if it wasn’t for the efforts of Shigeru Miyamoto, perhaps the dinosaur may have remained this way. After Super Mario World Miyamoto was interested in making Yoshi the star of the next Mario game, even more so after the character received a handful of games that did not feel authentically Yoshi. Thus he began work on Yoshi’s Island but Nintendo’s marketing team did not support the idea, who wanted something visually stunning in a similar vein to Donkey Kong Country. This wasn’t what Miyamoto wanted to go for however and he stated at the time that “Donkey Kong Country proves that players will put up with mediocre gameplay as long as the art is good”. Judging from the popularity of Rare’s title and the exposure it received due to its stunning pre-rendered graphics, it seemed Nintendo didn’t want to follow this up with something that looked like an old Mario game. This actually inspired Miyamoto to develop the cartoonish graphics further, which lead to the wonderful storybook aesthetic that gamers and critics alike praised upon release. While Yoshi’s Island certainly did take some effort to kick off the ground, not only did it become one of the greatest and best looking games on the SNES, but it finally gave Yoshi a series of his own to build that was worthy of the moustachioed hero himself. Two very different looking games… for me though its the crayon look that has aged better. This is what Tetris Attack actually looks like. At least Lip’s Stick managed to make it into Super Smash Bros.
Where did all the lovely crayons go?! 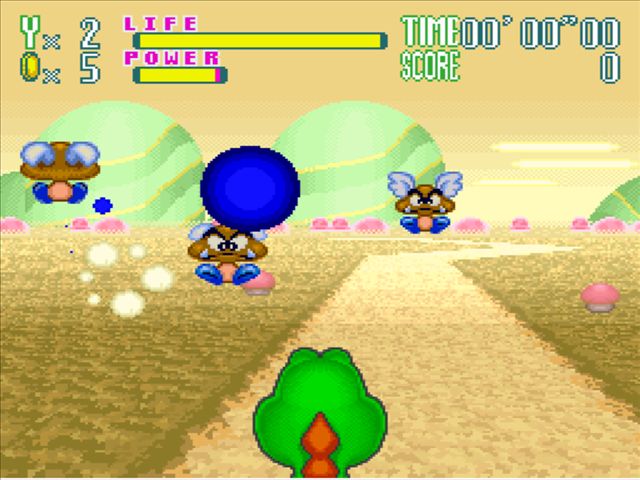 A sequel to Yoshi’s Island did appear not long after in 1997 for Nintendo 64; Yoshi’s Story utilised 3D graphics on a 2D plane but was sadly a shadow in comparison to its predecessor’s glory. Stripped down in scale, incredibly easy and lacking certain features (such as vehicle transformations), Yoshi’s Story was not the success many might have hoped it would have been. 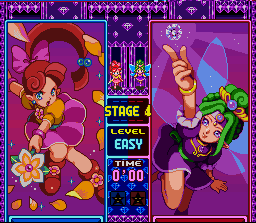 Furthermore a puzzle element was added in which players would have to figure out how to achieve the highest scores on each stage, which was ultimately where the true depth of the game was to be found. It seemed Yoshi hadn’t quite shaken off his puzzler origins quite yet. This was eventually followed by Yoshi’s Universal Gravitation on the Game Boy Advance which utilised a tilt sensor installed within the cartridge. 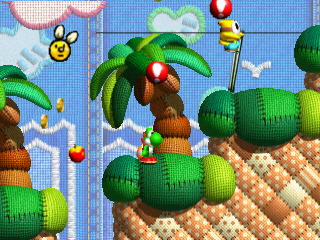 This meant much of the gameplay was achieved by tilting the handheld to move the environment around Yoshi. Sadly though this feature saw better use in other titles like WarioWare: Twisted! and Kirby Tilt ‘n’ Tumble; under Yoshi’s name it was not so well received and again the dinosaur succumbed to ignite interest in a unique peripheral. Yoshi wouldn’t catch a break until Yoshi Touch & Go on Nintendo DS in 2005 which, while relying on the touchscreen as an alternate means of control like so many other early DS titles, and achieving high scores again being the spotlight here, was reasonably well received. These titles may have sprang from Super Mario World 2: Yoshi’s Island, but none really embraced the formula that made the original such a success. Oh my would you look at all those baby Mario characters! Yoshi Daycare centre has its hands full here. That is until Yoshi’s Island DS in 2006. 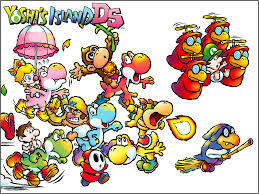 Finally returning to the core gameplay mechanics of the original SNES game, it also added new babies for Yoshi to carry, each allowing him access to unique abilities. The game was well-received and for a brief moment it was as if Yoshi had found himself again. Unfortunately today Yoshi’s Island DS is currently the closest game in the series to recapture the majesty of the original. Since then we’ve seen Yoshi’s New Island and most-recently Yoshi’s Woolly World on 3DS and Wii U respectively (the latter being the first console Yoshi game to appear since 1997). While both games largely retain the familiar gameplay mechanics of the original, neither has realised their full potential, leaving Yoshi in mediocre waters once more. At least Yoshi made of wool makes Yoshi cuter than ever before! 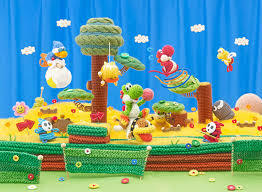 Thus while the aesthetics have remained cute, lovely and engrossing throughout the series (with Woolly World receiving particular merit for this), it seems in terms of gameplay Yoshi has yet to best his first solo outing on the SNES. His appearances in the Mario franchise are still top notch and highly anticipated but it seems on his own terms there’s more to be desired. Only time may tell if Super Mario World 2: Yoshi’s Island will be bettered but in the meantime, thanks to the dinosaur’s popularity, it’s unlikely the series will go on hiatus anytime soon. 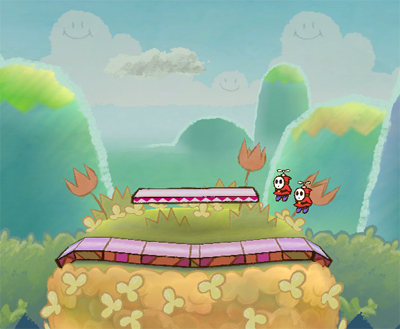 The Super Smash Bros. Brawl rendition of Yoshi’s Island is based on the stages and art style of Super Mario World 2: Yoshi’s Island. While the enemies Shy Guys first appeared in Doki Doki Panic/Super Mario Bros. 2 they became Yoshi’s standard enemies starting in this release. The Fly Guy variation however first appeared here to bother Yoshi from above. Kamek the Magikoopa, who features on the stage Mushroom Kingdom U, was also first introduced in this game: he acted as the main antagonist and caretaker to Baby Bowser.